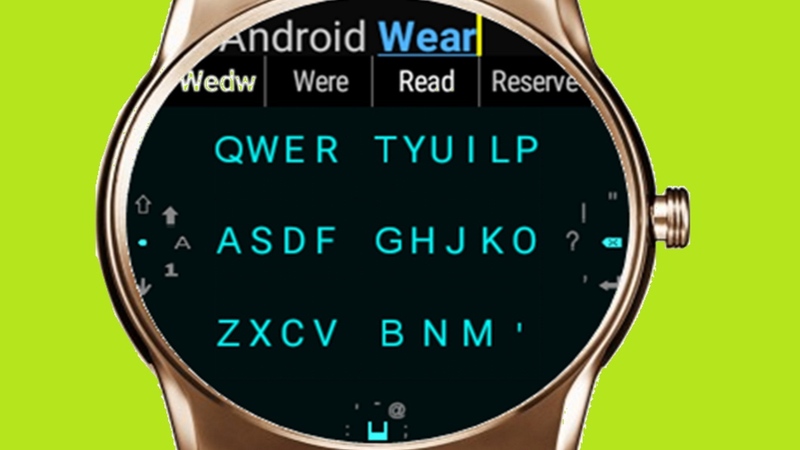 Snapkeys has launched its keyboard for Android Wear 2.0 smartwatches. There's a catch though. You'll only be able to use it on Android Wear 2.0 developer enabled smartwatches, which narrows it down to the LG Watch Urbane 2nd edition and the Huawei Watch. The original version of the Snapkeys keyboard, which was optimised for square screens was announced back in March. The round version was unveiled in July and now you can download it for free. Snapkey's business development manager Ryan Ghassabian told us that the early release is aimed at early adopters, and other developers, so they can get to grips with it. "We want to help give users a taste of what smartwatches will be like once Google officially launches Android Wear 2.0." When Wear 2.0 launches properly, it's possible Snapkeys will come with a price tag (which is still being determined). But if you've already downloaded the app onto your Android phone, your smartwatch will automatically update to include the Snapkeys Keyboard Package on the wrist without paying any fees. Using a quasi-T9 predictive text system, the keyboard is grouped together into six buttons. It may look strange at first, but it's still the same 'ol QWERTY keyboard that you normally see. The keyboard also tries to predict what you want to type, apparently with "very high accuracy." You can also add your own words to the dictionary by swiping right from the period key to pull up a larger keyboard. From there, bigger letters pop up and you can tap on individual letters to input your own words. There are also six languages available to use (English, French, Italian, Spanish, German, English UK). On the bottom on of the screen, you'll find the spacebar known as one of the "function buttons." Another, the backspace, is placed on the right. To use the symbols, like the question mark, you would swipe on the backspace key towards the symbol. The keyboard color can also be changed from the bottom of the screen where the space bar lives. Are keyboards the best answer for smartwatches? Typing on such a tiny screen doesn't sound easy and needs all the help it can get. We're still trying out Snapkeys for ourselves, and if it's as good as the company claims, it could make hammering out messages a whole lot easier. It does sound like the company has had a lot of experience dealing with keyboards and small screens though. Ghassabian says since the company was founded in 2008, it focused on innovating keyboard technology. "Our goal from the beginning was always to provide the fastest, most accurate keyboard technology. We've filed over 200 patents in the keyboard domain. We started out with keyboards for smartphones and tablets. We came up with the radical idea of using only a few keystrokes and a very strong predictive engine. "A couple of years ago, we saw that the smartwatch was something that was being talked about, more wearables were coming to the market and we noticed the big problem was inputting data into these small devices. So we decided to shift our keyboard technology to fit on small screens." This isn't the first innovation from Snapkeys. The company actually tried to Kickstart its own smartwatch back last year, but cancelled the project and decided to focus on the keyboard app. Advances in digital assistants and voice recognition software for smartwatches has gradually improved making keyboards seem redundant. But voice dictation from the wrist still needs work. External factors like noise make it difficult for the mic to catch phrases, and word recognition in general can be spotty. Typing out text messages, emails or to-do lists in public is also much more private and discreet than yelling at your wrist. A good keyboard in addition to the perks of voice dictation, could make untethered smartwatches truly standalone from a smartphone, and stand apart as something actually useful. Here's hoping Snapkeys has cracked it.